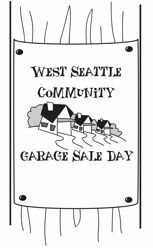 « Registration for 2013 West Seattle Community Garage Sale Day starts April 1st! This entry was posted on April 2, 2013 at 2:04 am	and is filed under Registration. You can follow any responses to this entry through the RSS 2.0 feed. You can leave a response, or trackback from your own site. Why us the sale only 1 Day? It used to be 3 days…………it should at least be 2 days. Anyone else agree? Is it possible to reserve a table in some of the community spaces? Hotwire Coffee and C & P Coffee are doing it again! We shared the update on WSB on Monday and will post the info here soon too if you missed it. Thanks! Ok sorry,form just fully opened up. Still, you could put cost in text up front. $12 for individual. Got it. I’ll be signing up. Thanks!